The Scottish Highlands is known all over the world for its famous hospitality. Grand country houses and beautiful views are to be found here, which surely rank amongst the finest in the world. Little wonder that so many celebrities decide to get married in the most romantic of places. Address: Glencoe Village, PH49 4HT, Scotland. Key Features: 5-star accommodation, historic house, beautiful location, Concierge service, sea or mountain views, private suites. The ultimate in luxury, Glencoe House comprises 14 individual suites, all with private sitting rooms and private hot tubs on the terrace. The suites are nothing short of sumptuous with generous emperor sized beds and the latest in luxury mattresses. The sitting rooms boast fireplaces or stoves which are stocked with wood, so you can enjoy your own fire. All the suites have kitchens with a fridge full of goodies for a relaxing breakfast. Or you can have the option of breakfast in your room cooked by the chef. Dinner is served in the great hall, or in your suite if you prefer. Ten acres of gardens are available for guests to explore. Local amenities include hiking and climbing, outdoor pursuits like hunting, shooting and fishing; water and adventure sports, and historic castles. The nearby town of Oban provides shopping and other diversions. This boutique 5-star hotel, located close to the village of Glencoe, is a place of retreat, away from the city, and, standing in one of the most romantic glens in Scotland, it’s the perfect place to hold the wedding of a lifetime, or have the honeymoon. Key Features: Beach front location, sea views, swimming pool, spa and wellness centre, room service, golf course and tennis courts. 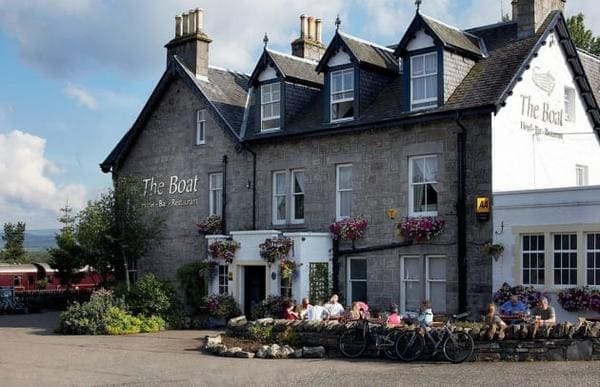 On the beach front overlooking the Moray Firth, this comfortable old-style hotel with spa and sports facilities is within walking distance of the historic coastal town of Nairn. Inverness airport is less than 7 miles away. The breakfast buffet has an array of continental options, with full English or Irish breakfast. For fine dining in the evening try the Fairways restaurant, awarded an AA rosette. For a more casual meal The Links Brasserie is a contemporary restaurant in the conservatory, with panoramic sea views towards the Black Isle. Afternoon tea is served daily in the lounge. Nairn golf club is less than half a mile, and for an extra charge guests can use the hotel’s tennis courts. You can stroll along the beach for free. There is a lift to upper floors, and a 24-hour reception. Spa facilities include massage and beauty treatments, indoor pool with sea view, and an outdoor hot tub. Guests can enjoy free wifi and free parking. With room service and a garden for guests, this is a family friendly hotel with a good choice of family rooms. Pets are allowed on request but this may incur an extra charge. Key Features: Quiet location, on North Coast 500 route, near to Inverness Castle, mini bar. Value for money. Drumdevan hotel was built in 1880 from an original private mansion which dates back to 1790. Its terrace is protected by Historic Scotland. It is set in extensive private grounds, a beautiful and peaceful setting, with Inverness Castle 2.5 miles away. Guests have direct access to Loch Ness via a private road, just a 3 mile walk. Inverness airport is 9.9 miles away and Inverness railway station is 2.7 miles. While there are helpful staff on hand, there is a 24-hour self-service check in (a door code and instructions are given to you in advance) and continental breakfast is served on a tray in your room every morning at a time you request. This comprises a good selection of fresh fruit and pastries with coffee or tea. For those who enjoy privacy there is minimal interaction with staff. 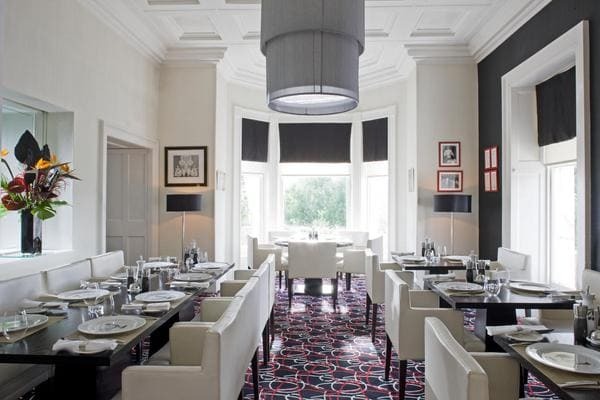 While there is no restaurant in the hotel, guests have generous sized rooms, most with a sofa or seating area, and Inverness, a 10 minute drive away, boasts some excellent dining options. Each room has a selection of fresh fruit and coffee or tea making facilities. Key Features: Boutique hotel, concierge, Chez Rouz Restaurant, city views, central location. This lavish Georgian townhouse was refurbished in 2006 into a luxury boutique hotel with a modern design feel, and has the best you can expect from a 5-star experience. Close to the centre of Inverness it enjoys great city views. Located about half a mile from Inverness railway station and 8 miles from the airport, it is a short walk from the hotel to Inverness Castle, museum and art gallery, and the many diversions of this cultural highland city. Possibly the best feature of this hotel is Chez Rouz restaurant, with a modern French cuisine, using the best of local produce. Chez Rouz is considered one of the finest dining experiences in Inverness. The Rocpool also has an elegant Cocktail bar, the R-Bar, with a lounge. A superior breakfast is included in some of the room rates. All rooms have a mini bar, and 2 rooms even have their own hot tub. Guests can enjoy free parking and free wifi and there is a concierge service. Key Features: Ski resort, family friendly, fitness centre, swimming pools, climbing wall, spa facilities, near to family attractions. Located in the ski resort of Aviemore in the heart of the Cairngorms National Park, this luxury hotel provides a host of facilities as well as comfortable rooms. 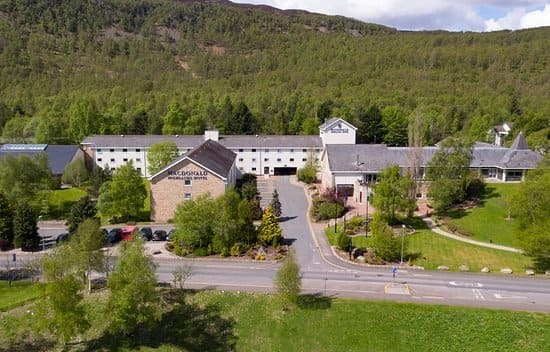 With Inverness airport 26 miles and Aberdeen airport 60 miles away, the hotel lies within 10 miles of 2 golf clubs, the popular Landmark Forest Adventure Park and Highland Wildlife Park as well as resort facilities at Aviemore. Breakfast and dinner are included in the room rates. A diverse buffet breakfast is available, and for other dining options guests can choose between an American diner with gourmet burgers and hot dogs, or the Inverdruie restaurant serving traditional Scottish cuisine. The Woodshed bar has a barbeque and sky sports. This family friendly hotel has a good selection of children’s menus and a child-friendly buffet. Children can also enjoy the playground and games room. Cycle hire is available. Facilities include skiing, climbing wall, mini golf, tennis and 2 indoor swimming pools. It also boasts a fitness centre, and spa facilities with massage and beauty treatments. Wifi is free in the public areas but comes with a charge in the rooms. Parking is free for guests. Key Features: village location, child-friendly, Steam Railway, beautiful scenery, open fire, wood burning stove, pet friendly. The Boat Hotel is a relaxed child-friendly establishment. Situated in the heart of the Cairngorms National Park and close to the award winning Landmark Forest Adventure Park, it is a perfect spot for families. The hotel stands next to a rural railway station on the Strathspey Steam Railway which runs between Aviemore and Broomhill. Inverness airport is 23 miles away. Boat of Garten is known as the Osprey Village, and you can spot these extraordinary birds at a hide about 3 miles away. There are many walks and cycle tracks from the village. One cycle track leads straight to Aviemore, 6 miles away. Or you can jump on the stream train. A variety of rooms are on offer including garden rooms with patios. Some rooms have mountain views. Dinner is served in the bar lounge, where you will find 2 AA Rosette food. Breakfast has a good selection of cooked foods. The guests particularly enjoy the welcoming wood burning stove in reception, and the bar lounge has a cosy open fire. The hotel enjoys free parking and there is free wifi for guests. The hotel is also dog friendly and dogs are allowed in the bar area. Key Features: Resort facilities, kid’s club, cinema, leisure centre, swimming pool, 7 restaurants, conference facilities. This hotel forms part of the Macdonald Aviemore Resort, a group of 4 hotels within Cairngorm National Park. Within the complex are 7 restaurants, a leisure centre and a cinema. Inverness airport is 25 miles away, and Cairngorm’s ski lift is 9 miles. This family friendly hotel has spacious rooms some of which are interconnecting. All rooms feature free wifi and ample free parking for guests. Modern Scottish and Mediterranean cuisine can be found in Aspects Restaurant within the hotel. Other dining options across the resort are a few minutes’ walk away, and include a burger bar and an Italian restaurant. A buffet-style breakfast offers full English or Irish, vegetarian and continental choices. Full room service is available. This hotel caters for every event from business conferences to weddings, with a range of business facilities and meeting rooms, banqueting facilities, a bridal suite and even a chapel! The hotel has direct access to the resort’s leisure facilities including the heated indoor swimming pool, gym, spa, body treatments and steam rooms, children’s soft play area, and a café. Close by is a championship golf course. Many other activities are on offer, like fishing, mini golf, bicycle hire and a kid’s club. Key Features: 24-hour reception, town centre location, beautiful views over Loch Linnhe, within easy reach of local sights. Nestled in the shadow of Ben Nevis, the Cruachan Hotel is a neo-gothic style building overlooking Loch Linnhe. It is 5 minutes’ walk from the centre of Fort William, a mile from the Railway Station, and 1.5 miles from the beautiful Glen Nevis. Many rooms have views over the loch. The nearest golf course is 2 miles away. The Cruachan has a lift to upper floors. Free parking, though spaces are limited and cannot be reserved. There is free wifi available in all areas, a 24-hour reception, and a luggage storage facility. The hotel has a no pet policy. Breakfast is a buffet bar with cereals and continental choices, plus a cooked menu with a wide variety of options. There is a children’s menu, and family rooms are available. The dinner menu is a range of international options, served in a spacious restaurant, with a bar, and a terrace. All the food is made from locally sourced fare. The restaurant’s terrace boasts stunning views over the Loch and the mountains beyond. Between the hours of 22.00 and 0400 you can find a light menu at the bar. The hotel also offers packed lunches on request. Key Features: Stunning location, outdoor activities, swimming pool, gym and sauna, tranquil wedding venue. On a peninsula jutting into Loch Leven, this hotel setting is idyllic, with a serene view from almost every window. Situated close to Dragon’s Tooth golf course, there are opportunities for canoeing, fishing, and children’s activities. Fort William railway station is 25 minutes by car. Modern and relaxed in feel, this family friendly hotel has a swimming pool with jacuzzi, steam room, and well equipped gym. It will cater for family gatherings, weddings, and corporate events. It’s even possible to book the entire hotel for a sensational private house party on the banks of the Loch. All rooms are ensuite, with free wifi, and coffee and tea making facilities. Two of the rooms feature French doors leading onto the grounds, suitable for guests with dogs. Pets are welcome at a charge of £10 per dog per night. The restaurant serves high quality Scottish cuisine, with breath-taking views of the loch and mountains of Glencoe. You can eat in the lounge by the fireside, or choose the conservatory and be nearer the view. Next morning the same view comes with Scottish cooked breakfast, and a buffet selection of cold meats and cheeses, or fruit and pastries. Key Features: Near city centre, two restaurants, swimming pool, spa, hair salon, 4 acres of gardens, close to golf course. Just 1 mile from Inverness City Centre, this hotel stands in 4 acres of private gardens. Inverness Railway station is less than a mile away and the airport is 7 and a half miles. It is also a mile from the coast at Moray Firth and 7 miles from the famous Loch Ness. Kingsmills Hotel has two restaurants, the Inglis with a traditional British Cuisine, which operates a breakfast and dinner menu, and the more relaxed Conservatory restaurant, a brasserie which is open all day for breakfast, brunch, lunch or dinner. There is a bar and lounge with comfortable sofas and a full range of cocktails. With a swimming pool, spa facilities with saunas, a gym and a hair salon, there is much to occupy the guest. For the outdoor types the hotel is next to a golf course. Many rooms have garden views, some of the larger rooms have patios, and some overlook the golf course. Pets are allowed. There is free wifi, but the signal may be limited in some rooms. Beds are comfortable, and staff are very welcoming.